It seems that the Bud Light king is unaware of who his knight will be jousting. Spirits are high and the queen declares that it is a beautiful day for a joust. The king agrees very much saying that everything is just perfect. Soon, the blue Bud Light knight appears. With the crowd cheering behind him, our brave knight hands all of his beers to squires, so that it may not impede his jousting performance. With the horns blaring, the knight’s opponent appears. But we can’t see who he is, but he and his horse are wearing gold-plated armor. An intimidation tactic, maybe, but it is clear that the Bud Light knight is overmatched as he is soundly defeated. Much to the shock of everyone. Soon, this golden knight reveals himself to be the reanimated Gregor Clegane, who then walks over the knight and kills him the very same way he killed Oberyn Martell, by crushing his skull. But it doesn’t stop there. 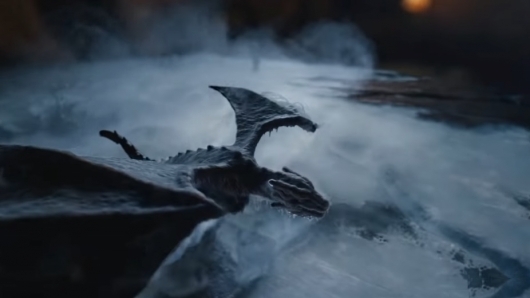 Soon after, one of Daenerys Targaryen’s dragons swoops in and burns the entire jousting court to the ground. This is a pretty surprising ad, to say the least. It’s so rare to see an ad like this. In fact, companies wouldn’t do a crossover or mashup like this. But that is what makes this ad so wonderful and fun. It’s that it was able to play nice by being able to market two things at once. The eighth and final season of Game of Thrones will start to air on April 14, 2019, exclusively on HBO.